Even if Josh Hamilton drops out of the home run race in the American League, good to know the state of Texas will still have a triple crown winner this year. 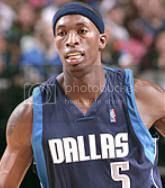 Mavericks guard/forward Josh Howard completed the trifecta by getting arrested for speeding in his hometown of Winston-Salem. Ironically enough, Howard was in town for a basketball camp sponsored by his foundation. Well, the campers should be happy to know that Howard was setting a great example by getting clocked doing 94mph and was charged with speeding, careless and reckless driving, and racing, according to the police report. That’s a pretty strong effort for just one evening right there. Thing is, this just caps off the perfect season for Josh Howard. If you remember back in May, there was a report out there that Josh Howard threw a birthday party following the team’s Game 4 loss in the playoffs against the wishes of Coach Avery Johnson. If you remember correctly, the Mavs lost in 5 games to the Hornets, and Josh Howard had a horrendous series. Yes, and that all came after Howard admitted to toking up the ganja as well. Like I said, our man sure did complete the trifecta. All he needs to do now for the superfecta is follow in the Travis Henry footsteps.